Alexander Payne (born Constantine Alexander Payne; February 10, 1961) is an American film director, screenwriter, and producer, known for the films Citizen Ruth (1996), Election (1999), About Schmidt (2002), Sideways (2004), The Descendants (2011), and Nebraska (2013). His films are noted for their dark humor and satirical depictions of contemporary American society. Payne is a two time winner of the Academy Award for Best Adapted Screenplay, and a three time nominee of the Academy Award for Best Director. Payne then attended Stanford University, where he double majored in Spanish and history. As a part of his Spanish degree, he studied at Spain's University of Salamanca and later he lived a few months in Medellin, Colombia, where he published an article about social changes between 1900 and 1930. Payne got his MFA in 1990 from the UCLA Film School. Payne's most recent project, entitled Nebraska, starred veteran character actor Bruce Dern and SNL comedian Will Forte. It was released on November 15, 2013. According to The Guardian, Payne revealed to Anne Thompson that during his seven-year hiatus between Sideways (2004) and The Descendants (2011), he, along with Jim Taylor, was working on another film project titled Downsizing. Payne has described the project as "a large canvas, science-fiction social satire" and "an epic masterpiece." The film was to star Paul Giamatti and Reese Witherspoon as an impoverished married couple who decide the way ahead lies in shrinking themselves. The project was superseded by The Descendants and Nebraska. Downsizing is Payne's next project, and Matt Damon is set to star. The film will be distributed by Paramount Pictures. In March 2016 Witherspoon was replaced by Kristen Wiig. Alec Baldwin, Neil Patrick Harris, and Jason Sudeikis have been added to the cast in currently unspecified roles. On October 2, 2015, it was announced that Paramount Pictures has acquired distribution rights and have planned a release date in 2017. It has been confirmed that Christoph Waltz and Hong Chau have been added to the cast. In 2000 he did an uncredited polish-up of the screenplay for the comedy hit Meet the Parents. In 2001 Payne wrote a draft of Jurassic Park III. Payne's films often revolve around middle-aged or older men who reach a breaking point in their lives, enter into transformative existential crises, and then emerge in the end as changed people, for better or worse. Some unexpected life experience forces the central male figure to "crack" and see the world in a new and surprising way. This theme appears in Election, About Schmidt, Sideways, The Descendants, and to a lesser extent in Nebraska, via the main character's son. His movies also tend to involve infidelity, road trips or travel, tragedy, despair, disappointment, and crises of masculinity. He has set many of his films in Omaha, which happens to be his home town. His films sometimes include scenes of historical landmarks, black and white photographs, and museums, and he often uses amateur actors for minor roles. His films tend to have a strong connection to a physical environment, for instance California wine country or midwestern plains or Hawaii, and have a gentle and sedated pace to them, often aided by ambient or atmospheric music. Nearly all of his films are dramas that nonetheless incorporate significant comedic elements and portray characters that are vulnerable and flawed but also likable. In 2012 he was named as a member of the Jury for the Main Competition at the 2012 Cannes Film Festival. His 2013 film Nebraska was nominated for the Palme d'Or at the 2013 Cannes Film Festival. With the "Nebraska" Academy Awards nomination in 2014, Payne has been nominated for the 6th time. Payne married Korean-Canadian actress Sandra Oh on January 1, 2003, after dating her for three years, and directing her in Sideways. On March 12, 2005, a publicist announced their separation. The divorce was officially finalized on December 22, 2006, although the former couple took more than two years to settle their finances. In 2015, Payne married Maria Kontos. Payne is co-owner (along with friend Ann Beeder) of King Fong, a Chinese restaurant in Omaha. ↑ "Entertainment: Sideways director keeps it real". BBC News. January 25, 2005. Retrieved 17 September 2010. ↑ Fischbach, Bob (November 21, 2011). "'The Descendants' debuts in Omaha". Omaha World-Herald. Retrieved 13 November 2013. ↑ Mikulan, Steven (April 21, 1999). "High Plains Joker: Alexander Payne's Wild, Wild Midwest". LA Weekly. Retrieved 17 September 2010. ↑ Papapostolou, Anastasios (May 19, 2013). "Exclusive: Alexander Payne Talks Nebraska, Greece & American Cinema". Hollywood Greek Reporter. Retrieved 13 November 2013. 1 2 Papapostolou, Anastasios (May 18, 2013). "Alexander Payne Talks Nebraska; Cinema; Greece" (Video interview). Greek Reporter. Retrieved 13 November 2013. 1 2 3 4 5 Talbot, Margaret (October 28, 2013). "Profiles: Home Movies: Alexander Payne, High Plains auteur.". The New Yorker. Condé Nast. p. 50. Retrieved 13 November 2013. ↑ Rhompotis, Demetrios (March 6, 2013). 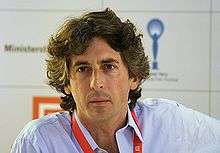 "Film Director Alexander Payne: Greece 'energizes my DNA!'". NEO Magazine. Retrieved 13 November 2013. 1 2 "Payne (Papadopoulos) - Hoffman" (PDF). St. John's 100 Year Anniversary. St. John the Baptist Greek Orthodox Church. June 13–15, 2008. Retrieved 14 November 2013. 1 2 Feinberg, Scott (December 27, 2011). "Writer/Director Alexander Payne: 'I Don't Know How Talented I Would Say I Am' (Audio)" (Audio podcast interview article). The Hollywood Reporter. Retrieved 14 November 2013. ↑ Constantine Alexander Payne, Crecimiento y cambio social en Medellín: 1900–1930, Estudios sociales. Vol. I, N° 1. Medellín, septiembre 1986, pp. 111 – 194. ↑ Kelly, Michael (February 25, 2012). "Payne, Ware on to big-time awards". Omaha World-Herald. Retrieved 13 November 2013. ↑ Turan, Kenneth (September 16, 2011). "Alexander Payne Regis Dialogue with Kenneth Turan" (Video interview). Walker Art Center. Retrieved 14 November 2013. 1 2 Feinberg, Scott (December 27, 2011). "Scott Feinberg Interviews Alexander Payne" (Audio podcast interview). The Hollywood Reporter. Retrieved 14 November 2013. ↑ Weaver, Cathy (27 July 2003). "'SCHMIDT' DIRECTOR UNFAZED BY 'SNUB'". Retrieved 16 May 2015. ↑ Karger, Dave (11 February 2003). "Check out the top five Oscar surprises". Entertainment Weekly. Retrieved 16 May 2015. ↑ Chitwood, Adam. "Alexander Payne's NEBRASKA Moving Forward with Will Forte and Bruce Dern". Collider. Retrieved 2 December 2012. ↑ Han, Angie. "Alexander Payne's 'Nebraska' Eyeing Late 2013 Release; Will Forte and Bruce Dern Run Around Billings, MT in First Set Photos". /Film. Retrieved 2 December 2012. ↑ "Matt Damon downsizing with Alexander Payne". The Guardian. 6 November 2014. ↑ Fleming, Jr., Mike (5 November 2014). "Matt Damon To Star In Alexander Payne's 'Downsizing'". Deadline.com. ↑ "Kristen Wiig replaces Reese Witherspoon in Downsizing · Newswire · The A.V. Club". avclub.com. Retrieved 16 October 2016. ↑ Lesnick, Silas (8 January 2015). "Three More Join Damon and Witherspoon for Downsizing". Comingsoon.net. Retrieved 11 January 2015. ↑ Kroll, Justin (2 October 2015). "Paramount Nabs Alexander Payne's 'Downsizing' Starring Matt Damon". Variety. Retrieved 24 December 2015. ↑ Pedersen, Erik (10 March 2016). "Christoph Waltz & Hong Chau Join 'Downsizing'; '3rd Street Blackout' Gets NYC Release Date". Deadline.com. Retrieved 20 March 2016. ↑ "RUN FAST - A Short Film by Anna Musso by Anna Musso — Kickstarter". Kickstarter.com. Retrieved 23 November 2015. ↑ Biga, Leo Adam (September 24, 2013). "Nebraska Coast Connection Salon Q&A with Alexander Payne: The Filmmaker Speaks Candidly About 'Nebraska,' Casting, Screenwriting and Craft: Alexander Payne in conversation with Nebraska Coast Connection founder Todd Nelson". Leo Adam Biga. Retrieved 14 November 2013. ↑ Belloni, Matthew (November 16, 2011). "THR's Directors Roundtable: How to Fire People, Who to Steal From, and Amy Pascal's Secret Advice". The Hollywood Reporter. p. 3. Retrieved 14 November 2013. ↑ "2013 Official Selection". Cannes. 18 April 2013. Retrieved 18 April 2013. ↑ "Sandra Oh files to divorce husband Payne". UPI (United Press International, Inc.). April 18, 2005. Retrieved 13 November 2013. ↑ Lee, Ken; Stephen M. Silverman (December 27, 2006). "Sandra Oh Is Officially Single". People Magazine. Time Inc. Retrieved 13 November 2013. ↑ Lee, Ken (January 22, 2007). "Sandra Oh's Ex: No Spousal Support". People Magazine. Time, Inc. Retrieved 13 November 2013. ↑ Lee, Ken (October 18, 2007). "Sandra Oh and Alexander Payne's Divorce Finalized". People Magazine. Time, Inc. Retrieved 13 November 2013. ↑ "Oscar-winning Alexander Payne secretly gets married with a Greek woman". ↑ Fonda, Jane (July 24, 2012). "Alexander Payne, Laura Dern & an Amazing Weekend in Omaha". JaneFonda.com. Retrieved 14 November 2013. ↑ Andrew Stewart (2013-05-17). "Alexander Payne Screens 'Nebraska' Cannes, Nebraska Coast Connection". Variety. Retrieved 23 November 2015. ↑ Richard Verrier (2013-11-20). "Alexander Payne's 'Nebraska' shows state's deep roots in Hollywood". LAtimes.com. Retrieved 23 November 2015. ↑ "The Coffee Table Coffee Table Book". Black Dog Publishing. Retrieved 13 November 2013.